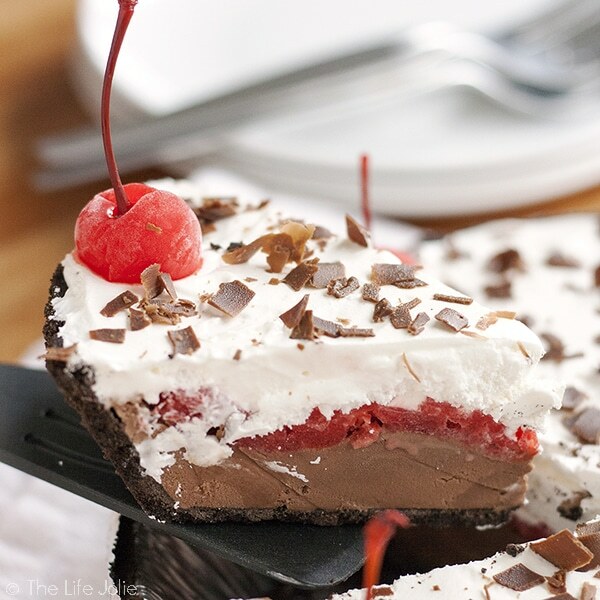 This Black Forest Ice Cream Pie is a quick and easy no bake dessert recipe. 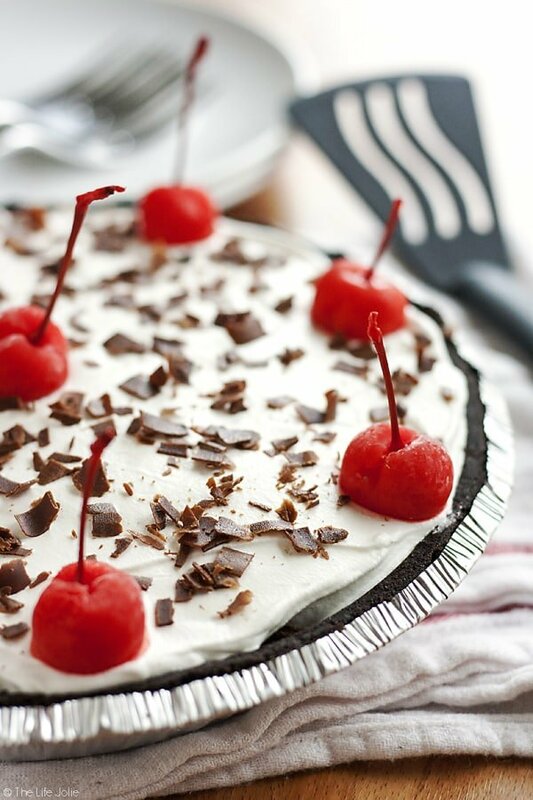 Made with an Oreo Cookie crust, chocolate ice cream, maraschino cherries and whipped topping this pie is a pretty addition to any dessert table! 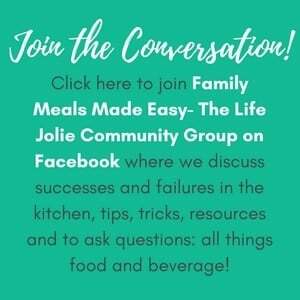 It’s perfect for the holidays or to keep in the freezer “just because”! Man has this week been a bummer! I was out of commission Monday night and Tuesday. There’s been a little stomach thing going around here lately. I can’t 100% accurately pinpoint it’s origin but I have my suspicions. Funny story actually. Last Friday, we joined my sister and took the girls to see Disney on Ice and being the rabid Disney fans that we are, everyone was pretty excited. Without going into too much detail, lets just say that just before the show started, T had the largest, projectile spit up that I have ever seen in my entire life. Seriously, I’ve never seen anything like this in my entire life- I was covered along with my seat and the floor. Then she got J at intermission and spit up a bit more in her seat on the way home. The big miracles of the night included the fact that J packed two extra outfits instead of the usual one. The other was that her car seat somehow remained clean during the last spit up incident. Suffice it to say, I spent the whole weekend in mass paranoia that I would get a stomach bug (even though T slept beautifully for the rest of the night and has been totally fine and healthy every day since). I felt decent all weekend, outside of my usual high anxiety, but it all went down hill by midday Monday. It wasn’t as horrible as it could have been (I got out of this thing without puking so that’s a plus!) but needless to say I was out of commission with a churning and uncomfortable stomach Monday night and all of Tuesday 🙁 But I’m back and feeling much better! 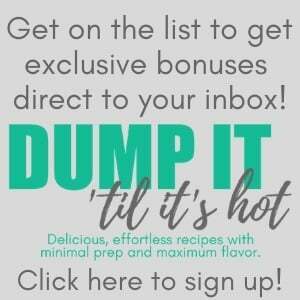 So now that I’ve completely destroyed your appetite, lets talk about this recipe, shall we (hows that for a transition?)? This has been bouncing around my head since before Christmas but life happened and I couldn’t get my act together to share it until now! I stand by my strong belief that one should always keep an ice cream pie in the freezer. Not even for unexpected guests (because it certainly wouldn’t last that long in my freezer!). More because gosh-darn-it you deserve it! You may remember I made this killer Peppermint Ice Cream Pie last year. 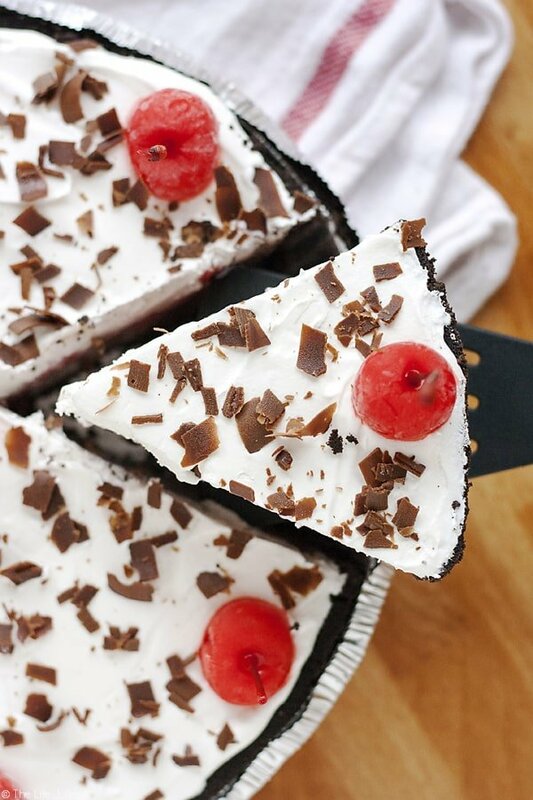 And being a lover of all things chocolate and cherry, I had to take a stab at combining an ice cream pie with a Black Forest Cake. This is such a quick dessert to throw together and easy as pie (see what I did there?!)! So easy, in fact, that my A helped me throw it together in a matter of 10 minutes. After getting my photos, I brought it to Sunday dinner at my parents house the next night and those slices went fast. 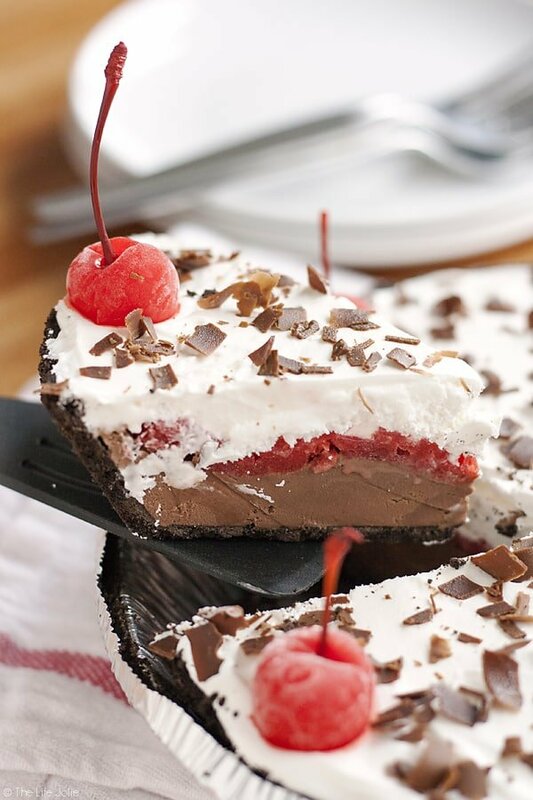 This Black Forest Ice Cream Pie is a quick and easy no bake dessert recipe. 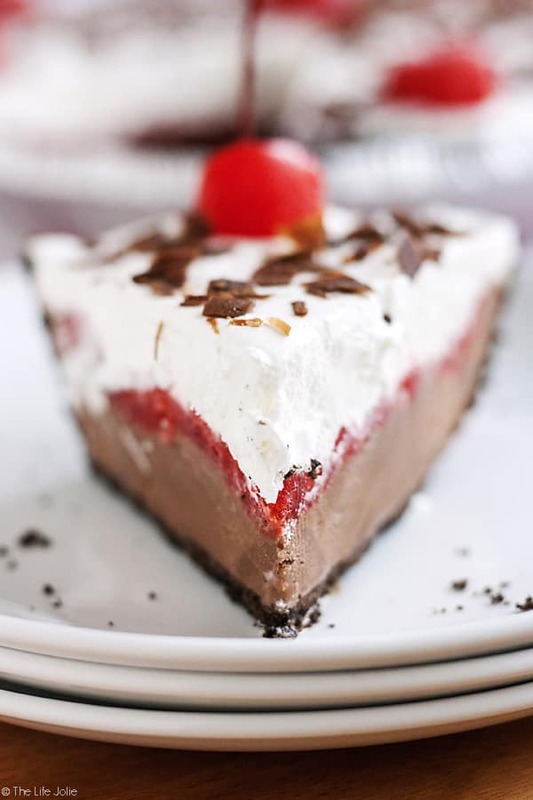 Made with an Oreo Cookie crust, chocolate ice cream, maraschino cherries and whipped topping this pie is a pretty addition to any dessert table! 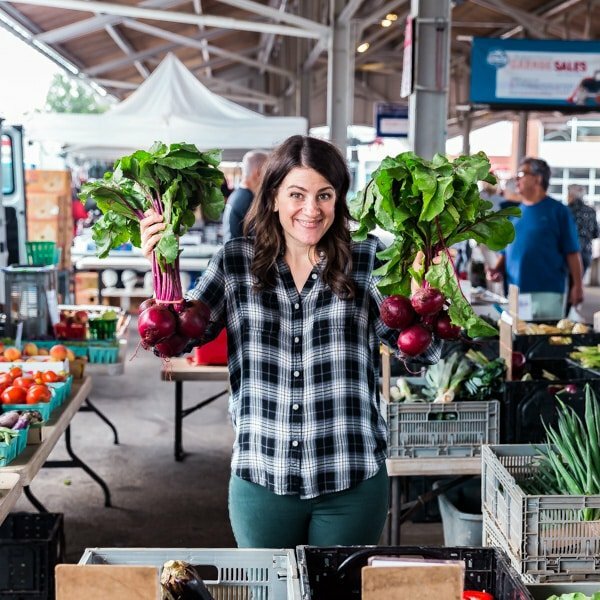 It's perfect for the holidays or to keep in the freezer "just because"! Pull your container of ice cream out of the freezer and let it sit out for 7-10 minutes to soften it. 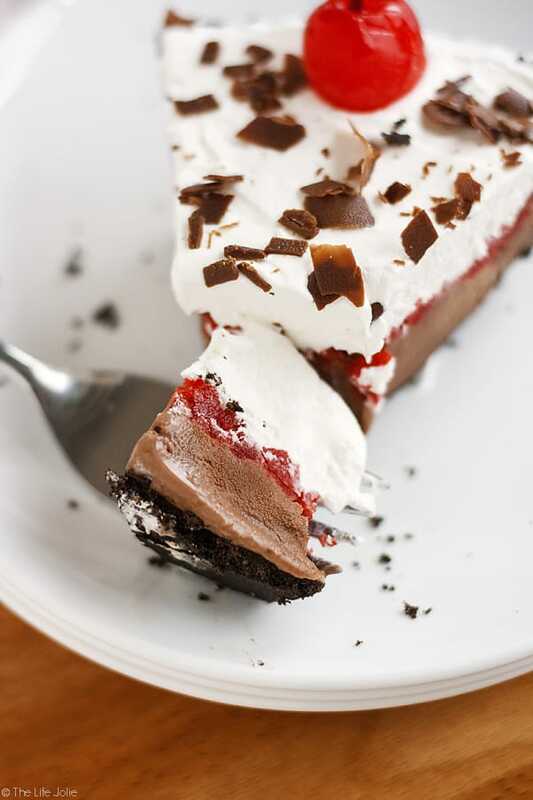 Carefully spread your ice cream inside of the pie crust leaving about 1/4 of an inch of space above it. Use a spatula to smooth the top of it (I use my offset spatula). Evenly distribute your chopped cherries on top of the ice cream. Next, carefully spread a layer of whipped topping over the cherries to cover the top of the pie. 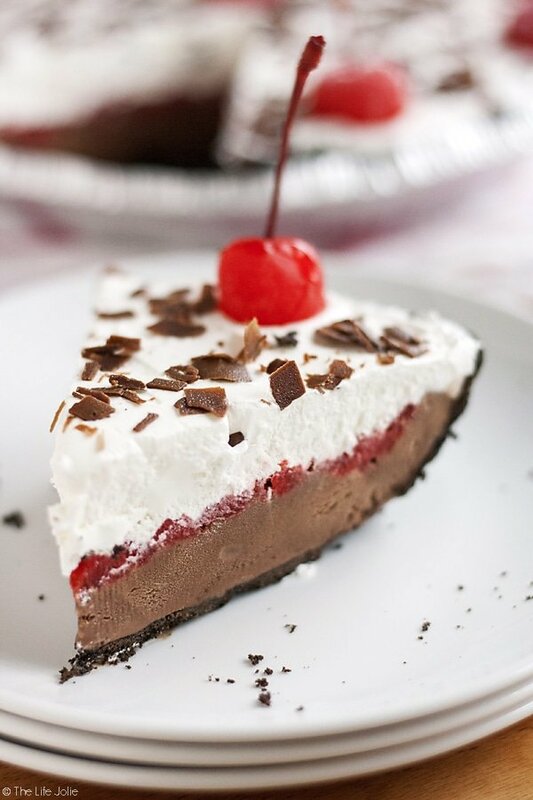 Decorate by placing 8 of the whole cherries around the perimeter of the pie, evenly spaced and the other cherry in the middle and sprinkle with shaved chocolate. Place your pie back in the freezer for at least an hour. 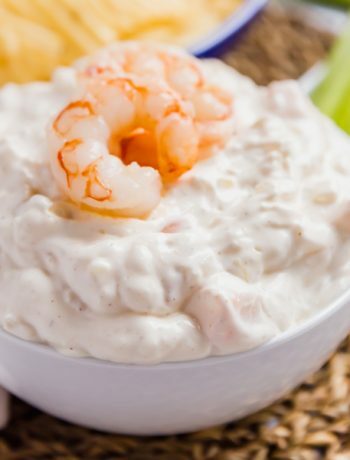 After the hour, cover it and keep in the freezer until serving. January 26, 2017 at 10:51 am Hi there! Ice cream cake is close to my heart. It has been a favorite of mine forever. 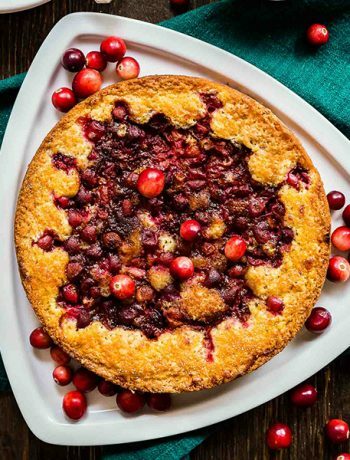 Your photos capture this pie perfectly! I love the chocolate crumbles on top! January 27, 2017 at 8:33 am THank you! It's close to mine too- we still indulge in the Carvel Ice Cream cakes that you can get in the freezer at the grocery store! January 26, 2017 at 11:16 am In my opinion, Ice cream pie is the BEST kind of pie! haha this looks great!